Rachel Von | The Journal Gazette IPFW's Kolbie Knorr transferred to the Mastodons after a strong sophomore campaign at Quincy last year. 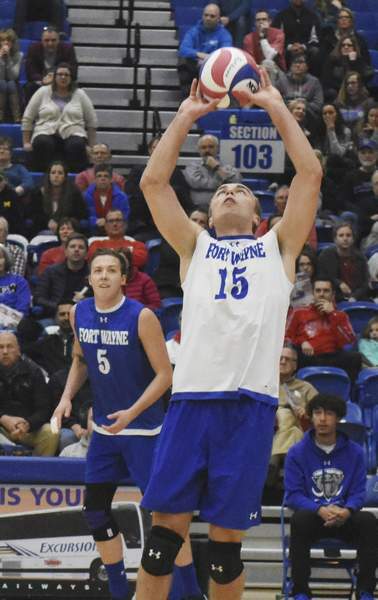 IPFW men's volleyball junior libero Kolbie Knorr, a transfer from Quincy, has boosted the team's ball-handling and passing en route to an 18-10 regular season record and a No. 5-seed heading into the MIVA Tournament at Lewis on Saturday. Growing up, Knorr participated in track, football, soccer, hockey, basketball, among other sports, before trying volleyball on a co-ed team in middle school in Wheaton, Illinois. Knorr earned the MIVA defensive player of the week as a sophomore at Quincy after double-digit dig performances against Culver-Stockton, Ball State and IPFW. The performance was stuck in the minds of the Mastodon coaching staff when Knorr approached them to inquire about transferring. “Last year, he was one of the top liberos in our conference and what he did to us at their place when we played in five sets, he was remarkable,” Perrotte said. The Mastodons were swept 3-0 in both matches this year against Lewis, but Knorr feels the team is peaking at the right time and has ironed out the details, particularly serving and passing. “We haven't taken a set off them all season, but I think that's more been about what we've done on our side of the net,” he said. “We didn't pass great those games, I don't think we hit that well or served that well. Passing and serving has been preached all year. In order to make up for size, we're not the biggest team, we have to pass and serve well and we've been stressing that all week in practice so I think it'll finally come together. With regular-season wins against then-No. 3 UC-Irvine and then-No. 14 Concordia-Irvine, IPFW should feel confident.